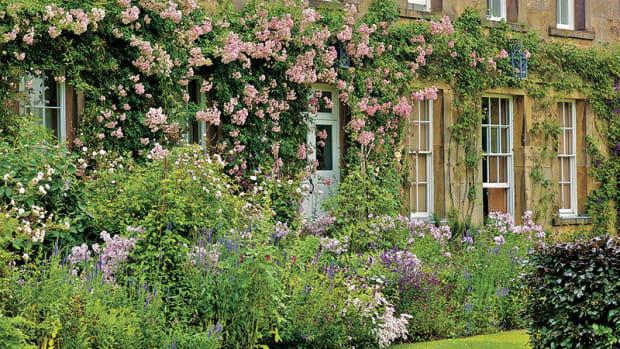 “Gardens that inspire.” That is the motto that Canadian landscape architect Virginia Burt lives and designs by. 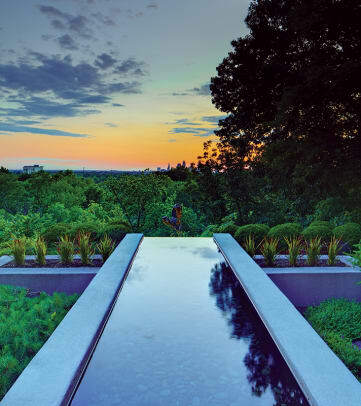 Burt, the founder of Ontario-based Virginia Burt Designs (formerly Visionscapes Landscape Architects) endeavors to engage the mind, body and spirit with every site plan, garden design and planting. Her award-winning residential and health-care center designs include “A Tale of Two Houses,” the 2014 Palladio Award winner in the residential category of Exterior Gardens and Landscapes. Burt’s holistic approach stems from her childhood. She grew up on a 200-acre apple farm in Ontario, where she learned everything from sorting cider apples to throwing them at her brother. “I walked the orchards every day and became aware of the rhythms of nature and life from tree to blossom to apple,” she says. She took up drawing at an early age, and at 15, met a landscape architecture student and was inspired. 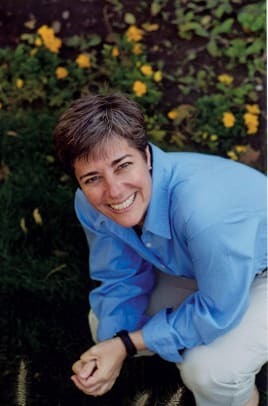 After graduating with honors from Ontario’s University of Guelph, she worked for landscape architecture firms in Aspen, Colorado and Toronto before opening her own firm in 1996.At her own Ontario home, which overlooks a wooded valley, Burt’s three-quarter-acre garden serves as fertile ground for experimentation. “It is our personal space where we share wondrous moments with a multitude of family and friends,” she says. Integrating, not imitating, nature was Burt’s challenge when designing a landscape for a new Shingle-style house in Ontario that overlooks the beautiful waters of Burlington Bay. The 2.8-acre property, owned by a couple with grown children, who were downsizing, slopes from street to shore, creating an ideal spot for a lap pool and loggia. “The object was to maintain and frame the views of this see-through house, where you can stand at the front door and look all the way through to the bay,” Burt says. Reflecting the architecture, Burt kept the front formal, with stone walls forming a motor court and entry garden. Planting beds of grasses, Siberian iris, Japanese anemones and spring bulbs are edged with boxwood and anchored with redbuds and hydrangeas. The property is adjacent to protected lands, so Burt borrowed from the landscape to expand views in back. The drama starts at the loggia, which Burt calls “a place of shade and wonder.” Working with the architecture, the loggia creates an “inside out” space nestled under the back deck. The loggia and terraces are made from Indiana limestone, New York bluestone and India grey slate. The rectangular lap pool includes a water feature and spa. “My inspiration was the bay,” she says. “The pool experience was designed to feel immersed in nature – so we designed to hide railings and pool fencing. Plantings atop retaining walls and grasses that move with onshore breezes serve as a visual connection while softening the edges.”To further the naturalistic impression, she applied a cool grey marble-lite finish to the pool’s interior to create a subtle sparkle to match the bay and placed a curved corten steel sculpture at one end to screen the view of the street and calm visual noise. Plantings, which include grasses and Japanese maples, create a foreground and blend with the scenery beyond. When Burt was commissioned to create nature-inspired garden designs for a side yard of a traditional red-brick house in Burlington, ON, she used the confined space to advantage, proving that great gardens do not need a lot of room to grow.The owners – a couple with two grown children – wanted an English-style garden that looked as though it had been long established. Much of their half-acre lot was taken up by a long driveway, garage and swimming pool. They were, however, willing to sacrifice part of the garage and 15-ft.-wide by 85-ft.-long drive to bring them closer to nature. Burt enclosed the side yard and converted it into a trio of garden “rooms” that lead to the back garden and garage, part of which was converted into a potting shed and bicycle storage with dining beyond. A stone and arched brick entry wall and gate, reflecting the style of the house, lead to a surprise series of gardens that end at the former garage. The three small spaces – a sitting room; an “evergreen” room that is visible from the kitchen window; and an herb/cutting room – are tied together with flagstone floors and stone-faced walls. 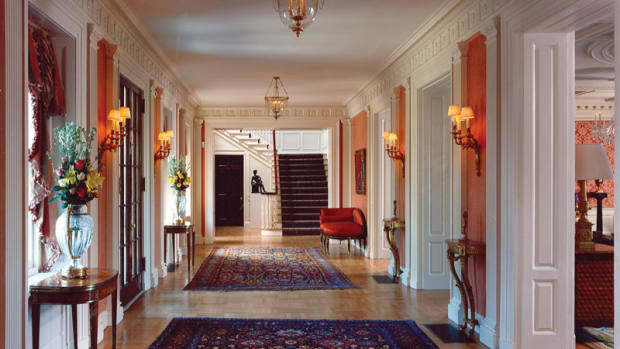 The sitting room, directly outside the back entry, is reached via flagstone steps and a pair of French doors. “We removed 15 ft. off the garage to create the sitting space and refaced its exterior with board and batten,” says Burt. “The space catches the morning sun and holds it like a precious gem. This is where the couple starts their day, sipping coffee with a water feature flowing gently in the background.” The space makes room for a potting bench and is filled with dwarf lilacs, Siberian iris and bergenia. The central room, which expands the horizon of the kitchen, is literally evergreen: It is bordered by all-season plants cut into circular and square shapes. The herb/cutting garden is planted with purple salvia, sunflowers, butterfly bushes and oxeye daisies. It features tuteurs for climbing beans, plus a statue of Bacchus set in front of a lattice window framed by Japanese iris, mandevilla and Japanese ribbon grass. “He is lit from the front, so one can see him outlined in the light when driving in,” adds Burt. 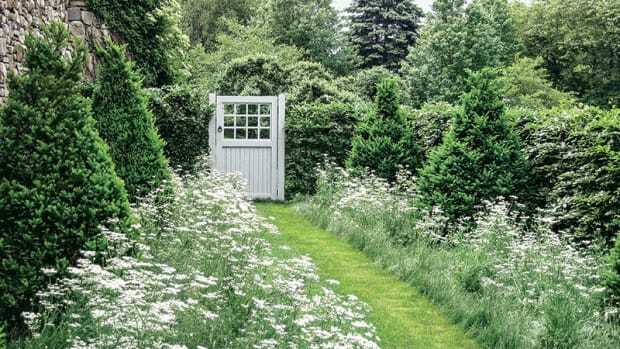 Once the cedar fence and arched door had aged a year, Burt had it painted a dark black green to better define the plantings within its borders. Set on a bluff, the ca. 1904 red-brick Arts & Crafts house offers a commanding view of downtown Cleveland, OH, and the owners commissioned Burt to replace a tired above-ground pool and create a design that emphasized the setting and reflected the fabulous sunsets. There were other major considerations. The wife was determined to undertake most of the maintenance herself, and plants and spaces were developed to make things easier. Under Burt’s plan, the drive’s island became center stage for “Day,” a bronze sculpture by Gary Weisman. Japanese forest grass and whipcord cedar create a soft-looking groundcover for a river birch whose leaves turn golden in the autumn sun. In the spring, the statue is surrounded by the giant purple pom-poms of allium. “They seem to dance around it,” says Burt. At the entrance, (the house had been modified in the 1920s, and the front and back entrances were reversed to accommodate a change in the streets), Burt formed a series of planting beds with massive sandstones from one of the state’s old bridges. Steps through the beds also walk in history: They are made with reclaimed sandstone curbs from the city. Plantings in this filtered-shade garden surround an original gazebo that Burt had restored and illuminated. They include Japanese maples, Mugho pine, rhododendrons, liriope, Corsican mint, hostas, pachysandra and astibles. To blend indoor and outdoor spaces, Burt designed a two-level, infinity-edge pool filled with black Mexican washed stone that extends into the back garden. It aligns perfectly with the central floor plan so as one enters the front door, one’s eye is pulled outside toward the downtown view. There, she placed “Night,” the companion sculpture to “Day,” and flanked it with Japanese blood grass. “The sculpture emerges from the water, as you walk down the hall,” she says. On one side of the linear reservoir, creeping Scots pine defines an adjacent sitting terrace; on the other, thyme, often used by the owners for cooking, marks stepping stones to the lower terrace. Burt gave new life to the front courtyard of a ca. 1910 house in Chagrin Falls, OH, by rooting her designs in tradition. The 28-acre estate, originally a hunting lodge for a Cleveland industrialist, features a red-brick main house and wood-framed sleeping wings. The architecture and current owners called for a symmetrical design, and Burt used a border of boxwood to convey formality in two grassy panels bisected by a red-brick walkway. The front porch steps were replaced with semicircular 4-in.-thick bullnose sandstone risers, a wrought-iron railing and a pair of urns on plinths to create a sense of invitation. Green pillar oaks emphasize the front façade. Burt repaved the walkway with reclaimed brick and created a “welcome mat” of bluestone at the front gate. Early spring color comes from forsythia and daffodils that were planted in beds framed by reclaimed sandstone curbing. Burt played off the rhythm of the wings’ windows with tall Hinoki false cypress to add four-season interest. Japanese maples, azaleas, geraniums and Siberian iris add color. 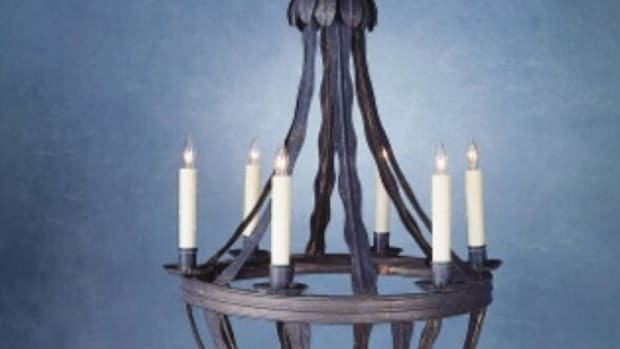 To give the residence a sense of history, she painted the sleeping wings in a darker shade of Colonial blue and made the shutters a deep black. Burt continues to work on the surrounding gardens, which include the lower walled garden. 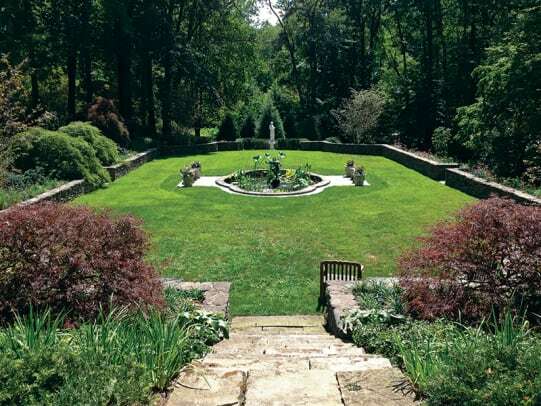 After repairing stone steps and repaving the area around the central water feature, Burt created a symmetrical design in an early-20th-century style. She added a bank of hemlocks that frames the long-distance view of a Classical statue of Pandora in evergreen while uniting garden views with the surrounding mature forest.